Dandy was designed to maximize space and storage with a clean and modern aesthetic. The white Hanex countertop and formica walls are sleek, easy to clean, and are durable enough to withstand every type of climate and bumpy road. 280 watts of Renogy solar, a Victron SmartSolar Controller, three BattleBorn Lithium batteries, and an AIMS 2000w Pure Sine Inverter give Dandy her power. 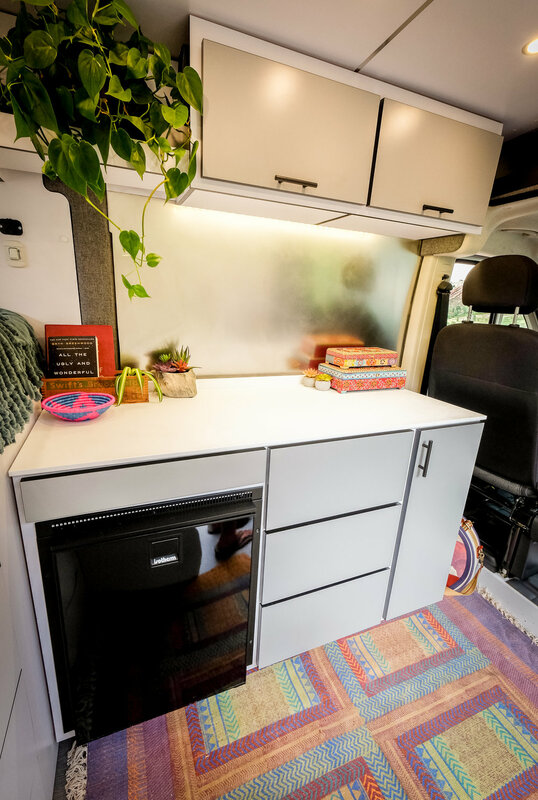 This build features a 4-zone dimmable LED lighting system, an Isotherm refrigerator, Maxxair 7500k remote controlled vent fan, and all of the outlets needed to make life on the road as convenient as possible. The high mounted bed allows for plenty of storage space.All of Dandy's electrical components are tucked neatly away in a custom fabricated battery box located in the garage. Despite its small size, Dandy was designed for maximum storage. The custom CNC cut cabinetry was designed to withstand all of the moving and shaking that comes with life on the road. 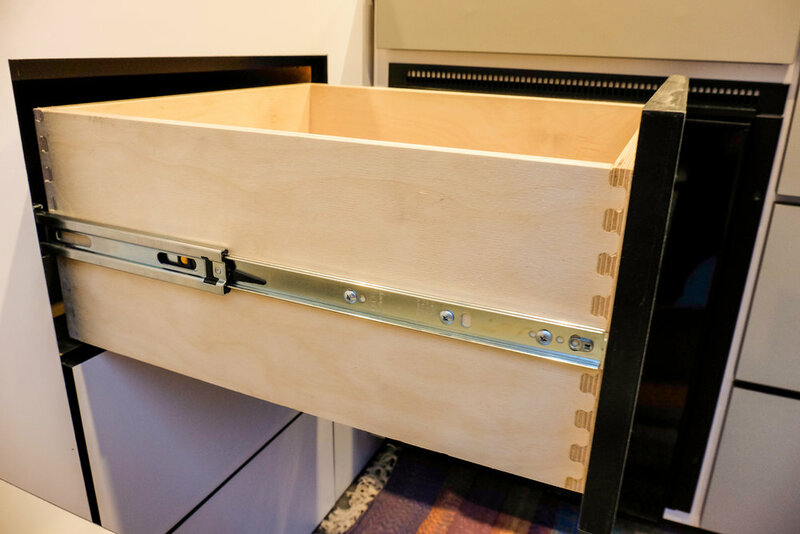 All cabinet doors and drawers have been fitted with touch-to-open hardware so they can stay securely closed on even the bumpiest of mountain roads. A rear mounted ladder and 3-crossbar roof rack are the perfect accessories to this sweet lil' ride. With a 136" wheelbase, Dandy can be easily navigated through city streets or country roads. Alaina Ann in her van, Dandy! Safe travels and thank you for letting us be a part of your new adventure!